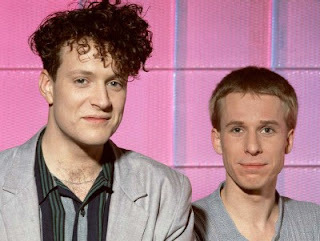 While UK '80s duo Blancmange may be best remembered as the 'zany' electro pop team behind break-out club hit 'Living On The Ceiling', pop culture vultures tend to overlook the team's darkly funky side that emitted the likes of 'God's Kitchen'. It's 27 years since they released the Happy Families album that was home to those aforementioned cuts, but they have returned with new material... and if it seems odd to say it was 'worth the wait'... well, it was. It's modern. It's still electric-ish. It's certainly less shameful than their '80s electro/dance contemporaries who hawk their arses on the retro circuit and way ahead of their non-retro-rollicking contemporaries Depeche Mode and Vince Clarke's Erasure, both who seem content rehashing sounds they settled on post-heyday.